The holidays are right around the corner, so now is the perfect time to start thinking about new holiday decorations to add to your home. Our Christmas catalog is chock-full of delightful holiday pieces and great gifts you’ll love to share. Grab your fuzzy slippers, a mug of hot cocoa and start scrolling, or flipping, through our pages to find a new treasure. Featured below is a selection of items our customers have raved about from our new Christmas catalog, so we know you’ll love them too! 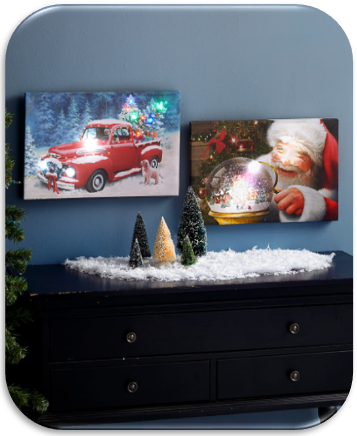 The spectacular holiday-themed image, paired with fairy lights and a crackled glass finish, draws the eye wherever you place it. It’s the perfect holiday item to complete your mantel or Christmas tabletop display. – Unique shape fits just about any tabletop. 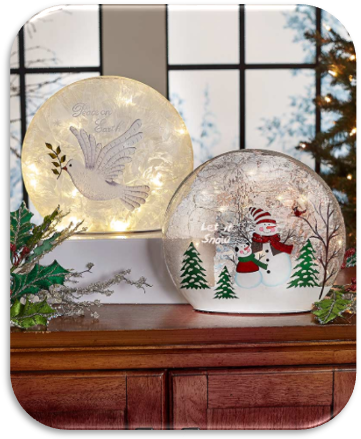 – Classic, snow globe-like appeal with beautiful light. Santa’s trusty sidekicks have never looked this good! These planters are not only adorable, but you’ll quickly discover additional uses for them. Take a traditional approach by planting beautiful poinsettias or greenery inside, or get creative! – Place an ice bucket inside and use it on your buffet table. – Add trimmed pine branches and adorn with ornaments and fairy lights. – Fill with scented pine cones and place near an artificial Christmas tree. Fill a room with music and color! Bright lights accent the vibrant print in just the right places, while a favorite song plays every time someone walks by. With the option to turn off the motion sensor, this piece will be a great addition to your wall all season! – Vintage artwork really pops. – Plays a familiar holiday song. 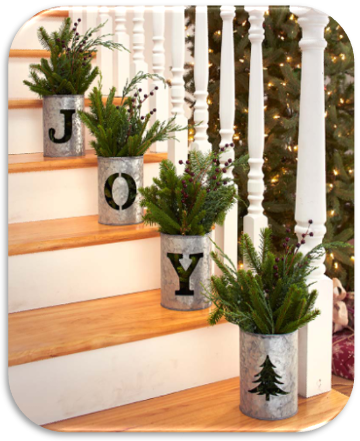 Showcase a festive holiday message in rustic style this season. 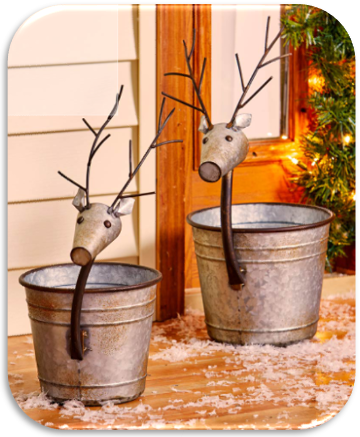 Accent these open buckets with your favorite decorations and they’ll also show through the creative cutout. Beautifully designed to add charm anywhere you place them! – Fill with Christmas ornaments for a pop of festive color. – Feature your own LED candles inside for an elegant glow at night. – Load up with goodie bags and set them by the door at your holiday party. 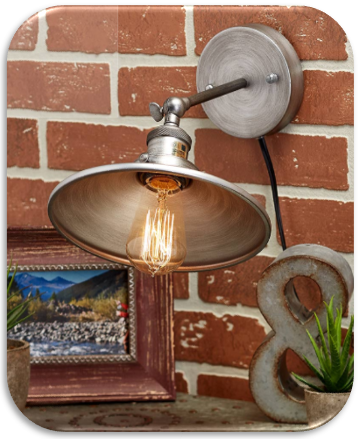 Ditch traditional style and invite an industrial-inspired look into your home with this wall lamp. Simply hang it up, add a light bulb and plug in! Its no-fuss construction makes this the perfect piece for anywhere you need some extra lighting. – Hang it over your bedside table to open up tabletop space. – Hang it near a comfy chair to create a cozy winter reading nook. – Hang it over colored bottles to enhance the vibe of your home bar. 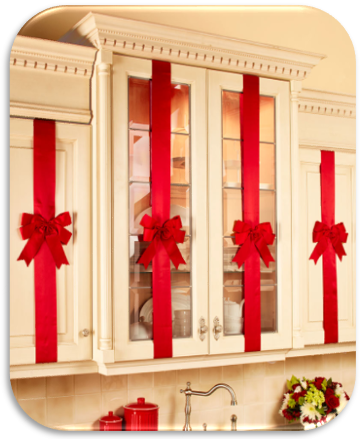 These bows make sure that every room in your home is dressed to the nines! They’re practically effortless to put up, and make a big statement all season in your kitchen or dining room. – Easily fits a wide variety of cabinet styles. – Fabric-magic closures make them convenient to install. – Large 9-inch bows are perfect to celebrate the Season of Giving. 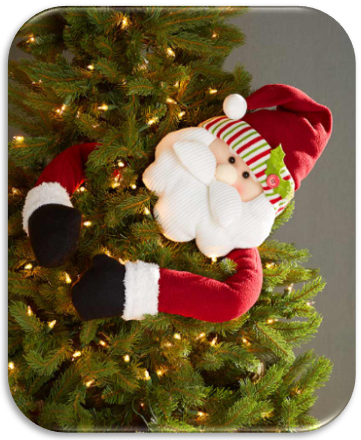 Wrap the bendable arms of this familiar face around your tree to give it the hug it deserves! The plush character helps keep the magic of the holidays alive, and it’s a simple alternative to traditional ornaments. – Wrap it around the top of your tree in place of a star. – Pair it with an oversized wreath on your front door. – Arrange it lower to make it peek out between branches. Pamper yourself with a sweet treat that doesn’t cost you calories! Let the stress melt away with a sweetly scented bath bomb. Simply unwrap to unwind in colorful water. Finish your spa day by moisturizing with a jojoba oil and shea butter lip balm. 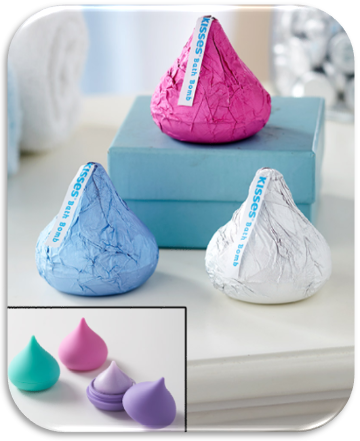 – Hershey’s Kiss shape also makes an iconic gift. – Both sets include three sweet, unique scents. – Simple way to relax during the holidays. Refresh your holiday decor with something vintage. The Garland and Tabletop Tree feature pine cones and berries among a variety of pine needles, while the vintage-inspired sign greets your guests in style. 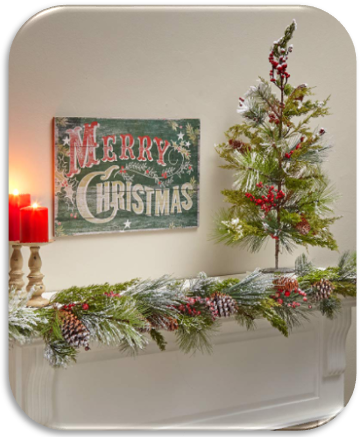 – Add the garland to your mantel or railing. – Place the tabletop tree on your entryway table. – Hang the sign near your serving table for a pop of color. Santa will jump for joy when he sees the cookies you’ve made for him with this set. 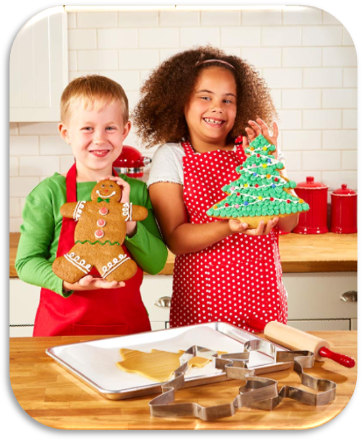 The jumbo size makes the cutters easy to use, and the finished product is a breeze to decorate. Now tie on your apron and get to baking! – Kids will get a kick out of the large size. – More cookie space to frost and decorate. – Traditional holiday shapes everyone will love. Our unique selection has something for everyone on your list! 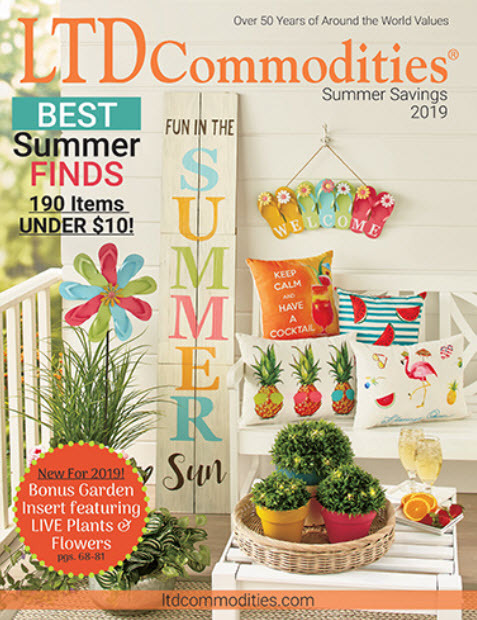 From home decor items and stocking stuffers to great gift ideas and more, you’re sure to find what you’re looking for at LTD Commodities this season. Start shopping our online Christmas Catalog (Winter Gifts 2018) today! Hi Nancy- We have requested a catalog for you. Please allow 1-2 weeks to receive your catalog in the mail. Happy shopping! Do you need to be connected to a company to shop your products? I haven’t received a catalog in a while would like to start receiving them again. My address changed. I have tried to order online and it always tells me to telephone my order. I have been ordering thru the mail but get no credit for shipping or other perks that my sister gets. What am I doing incorrectly? Hi Betsy – We deeply apologize you have been experiencing such issues with our online website. We would hate for you to miss out on our promotions. Please give us a call at 847-295-6058 and one of our agents would be more than happy to assist you further. Please send me a Christmas catalog so i can put my order in early. Thank you. Hi Lisa-We have requested a catalog for you. Please allow 1-2 weeks to receive your catalog in the mail. Happy shopping!